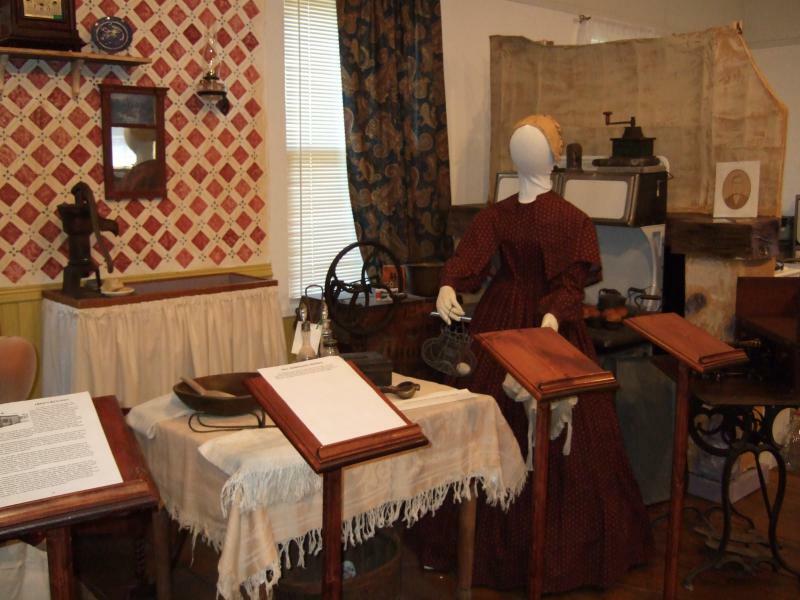 The Richland County Museum - Hearth and Home A look at everyday life in Richland County in the 19th and 20th Centuries, this display focuses on three kitchens, representing home life in 1800, 1860 and 1920, recreated on the museum’s second floor. 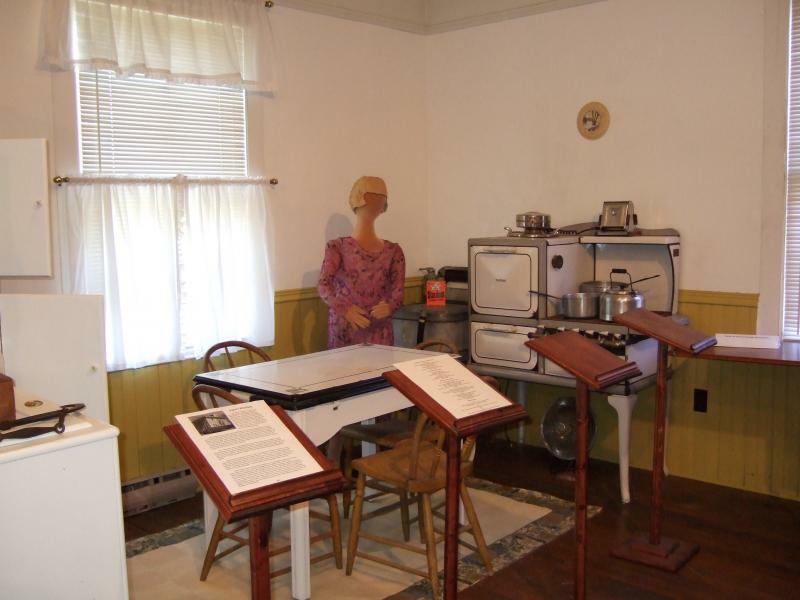 A look at everyday life in Richland County in the 19th and 20th Centuries, this display focuses on three kitchens, representing home life in 1800, 1860 and 1920, recreated on the museum’s second floor. 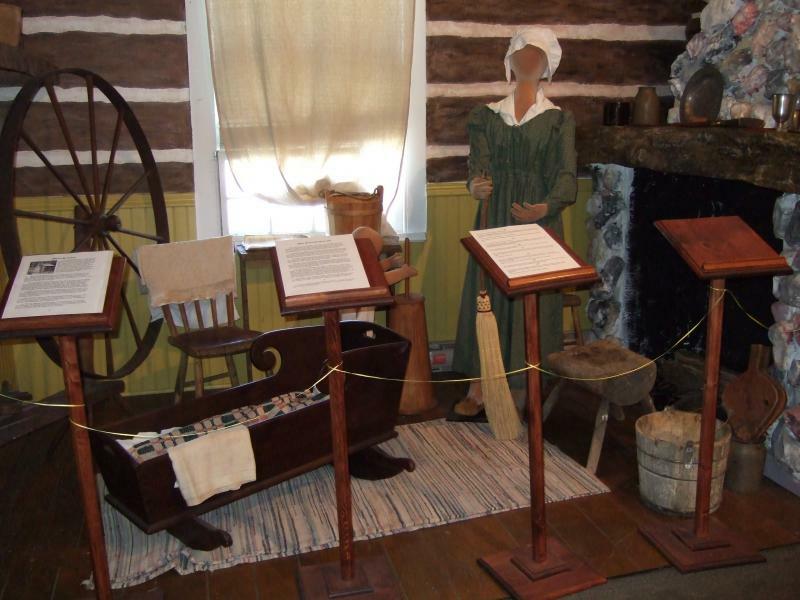 The 1800 kitchen features a large fireplace, a great wheel for spinning, and an antique cradle. By 1860, the kitchen has been “modernized” with a cast-iron stove, a Jenny Lind child’s bed and an early sewing machine. A vintage Tappan gas range, an ice box and a small “Hoosier” furnish the 1920 kitchen. A story line links the three kitchens as Richland County moves from frontier to the present day. Our kitchen starts out as a corner of a one-room log cabin, about 16 feet on a side, similar to this one. The entire Settler family, originally from New Jersey, lives in this cramped space: Mr. and Mrs. Settler, two sons and three daughters, Mrs. Settler’s brother, and Mr. Settler’s widowed mother. Mrs. Settler’s brother will claim his own land and marry the daughter of the gristmill owner, as soon as he helps his sister and brother-in-law prove their claim. By 1860, our humble log cabin has been clapboarded over, and several rooms added. A parlor in the front and two bedrooms upstairs, one for parents and one for their two daughters, allows some privacy and a division of living space. The three boys sleep in a small room added to the back of the old cabin. The cabin itself is now the kitchen of the house. The root cellar still serves to store canned goods and root vegetables, but is also used as a refuge for slaves fleeing to the North, as the current owners, Mr. and Mrs. Abolitionist, are conductors on the Underground Railroad. All the children go to school at least through the eighth grade. By 1920, both the log cabin and the mid-Century additions have been swallowed up. The original cabin has been divided into a kitchen and pantry, the parlor is a dining room, and the half-storey bedrooms have been extended to a full second storey and are Mr. and Mrs. Salesman’s bedroom. The Salesman’s have two children, a son and a daughter, who each have their own small bedroom. A formal living room and informal sun porch complete the house. Mrs. Salesman is a high school graduate and worked as a secretary for three years before she married Mr. Salesman. He has a two-year certificate from business school. Both children attend the public school in town and are expected to continue their education after high school. Copyright 2009 The Richland County Museum. All rights reserved.